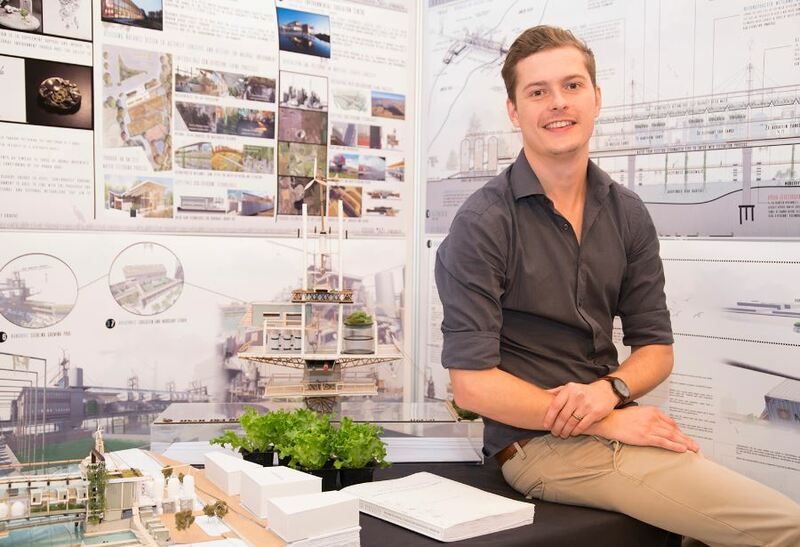 On 10 May 2017, Jean-Pierre Desvaux De Marigny from the University of KwaZulu-Natal was announced as the winner of the 30th Corobrik Architectural Awards. Some of the contributing factors to Jean-Pierre winning first place included new and distinctive ideas, a high standard of technical skill, creative flair, a good grasp of sustainability issues and a clear understanding of the complex role of built structures within an evolving urban environment. Jean-Pierre was presented with a R50 000 cheque at the event. He was one of eight regional winners who were chosen during 2016 from the country’s major universities. Each winner became a finalist who competed for the national title. Jean-Pierre’s thesis, entitled ‘Design for [bio] diversity’, explored the potential of architecture for ecological conservation, proposing an environmental awareness and water research facility in the context of Springfield industrial park/ uMgeni River catchment area in Durban. Bio diverse ecosystems are needed to survive, but as the population increases and urbanisation occurs, natural areas are often degraded and exploited, most critically affecting fresh water systems. The architectural solution that Jean-Pierre proposed aims to draw an analogy between the machine-dominated environment of the Springfield industrial park and the natural ecosystems found within the uMgeni river. This was achieved through the concept of viewing architecture as similar to a mechanical prosthetic device, so that the architecture (industrial machine) could begin to act as a natural life support system in the context in which it exists (ecology). “The project impressively straddles one of Durban’s most beautiful rivers, the uMgeni River, as well as the existing pedestrian bridge. The architecture is a machine that filters dirt from the river by drawing water up into its water purification plant. The filtering process takes place over the bridge, so by moving over the infrastructure, the purification of water as a process is visible to the pedestrian,” explained supervisor and lecturer, Bridget Horner. Corobrik Managing Director, Dirk Meyer, thanked this year’s judges for their invaluable input – Andre Eksteen, multi-award winning co-director at Earthworld Architects & Interiors, Tunde Oluwa, sustainable development guru and founder of Odyssey Architects SA and Tanzeem Razak, who is passionate about spatial transformation in South African cities and is director and founding partner of Lemon Pebble Architects in Johannesburg. For more information, contact Corobrik on Tel: +27 (11) 871 8600 or via www.corobrik.co.za.